IMDA (Info-communications Media Development Authority) has raised the standards of pre-approved digital solutions via its SMEs Go Digital Programme. This is in a bid to foster SMEs’ growth in the digital economy. Through SMEs Go Digital programme, the IMDA aims to progressively raise the standards of the pre-approved digital solutions for SMEs. The government body explained that pre-approved digital solutions are evaluated on criteria such as functionalities that meet SMEs’ requirements, ease of use, and pricing affordability. In addition, digital capabilities such as cybersecurity, data protection, data analytics, interoperability and compliance to standards will also be gradually included as part of the evaluation criteria. SMEs Go Digital programme also aims to uplift whole sectors by working with influential partners to deploy emerging technologies. One such pilot project shared at the Industry Briefing is the implementation of the 3D IoT Platform for Smart Buildings in Orchid hotel. The solution, implemented by Asahi Security Technologies, provides fully integrated facilities and security services that help building and business operators to improve decision making through 3D visualisation in the command centre. With the ability to retrieve timely and accurate data, it has allowed Orchid hotel to improve manpower deployment to generate greater customer satisfaction and also raises the efficiency of their staff by allowing them to concentrate on their core functions, helping them to improve their service standards. According to the press release, there are currently 56 pre-approved digital solutions under the SMEs Go Digital programme, to date. 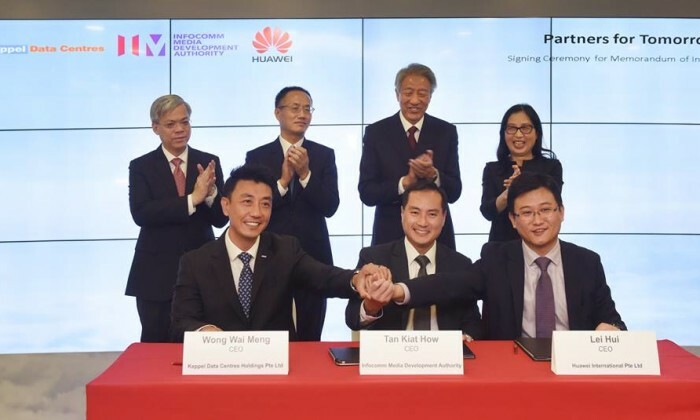 Furthermore, since the launch of the programme, over 100 SMEs have adopted 24 pre-approved digital solutions, generating over SG$2.4 million revenue for the infocomm media (ICM) suppliers. IMDA has also announced the appointment of Association of Small & Medium Enterprises (ASME) as the agency to operate the SME Digital Tech Hub, expected to be launched at the later part of the year. The hub will provide specialist digital technology advisory to SMEs with more advanced digital needs, such as data analytics and cybersecurity. IMDA added that the services offered by the SME Digital Tech Hub complement the business advisory service offered at SME Centres. “The SME Digital Tech Hub is timely as SMEs navigate the rapidly evolving Infocomm Media (ICM) landscape. The specialist advice provided by the Tech Hub will be much welcomed by SMEs as they embark on their digital transformation journey. I am hopeful that the SME Digital Tech Hub will be able to guide and help them seize the opportunities in the Digital Economy,” Kurt Wee, president of ASME, added. As part of IMDA’s sectoral transformation efforts, a Call for Submission (CFS) was also shared at the Industry Briefing for the industry to propose commercially-managed digital platform(s) that can drive the adoption of game changing technologies such as artificial intelligence, by companies, including SMEs. IMDA said the CFS will look to explore with the industry the feasibility of such a platform and how it could be developed. Submissions will be open until 8 September 2017. “To enable our SMEs to continually benefit from innovative digital solutions, we will progressively raise the standards of the pre-approved digital solutions under SMEs Go Digital programme and catalyse the development of digital platforms that provides them the access to game changing technologies such as artificial intelligence and data analytics,” Tan Kiat How, chief executive, IMDA, said. “Being an SME, we are at a slight disadvantage as compared to big brands out in the market. With this solution we will be able to get more timely and accurate data that will enable us to have better time management and manpower deployment,” Kayn Chng, assistant GM, Orchid Hotel, said. Jetstar calls out to all "Lobang Kings" and "Bargain Queens"